Was Di Matteo the architect of his own downfall? So here we go again. Another manager bites the dust at Stamford Bridge. Even considering Roman Abramovich’s record when it comes to sacking managers, I have to say I was very surprised he dropped the axe on Roberto Di Matteo. I am aware of the numbers: two wins in eight games. I am also aware that Chelsea are close to becoming the first European Champions League winner to be knocked out in the group stages of the competition the next season. However, I am not convinced changing managers at this point in the season is going to accomplish much, especially when whoever comes in will only have until the end of the season to work with these players. Di Matteo is the eighth manager to leave the post of Chelsea manager since Abramovich took over back in 2003, so it’s no secret that patience is not a virtue the Blues owner possesses. But even so, why sack a guy who won the Champions League six months ago and enjoyed so much success, when you clearly don’t have a plan B? So let’s look at what went wrong at Chelsea and how much blame Di Matteo should take. I would like to start by taking a look at the depth of their squad, or should I say lack of it. First of all, I question the decision to sign not one, not two, but three attacking midfielders who all play similar positions. A lot of money was spent bringing in Eden Hazard, Oscar and Marko Marin when Chelsea already had Juan Mata on their books. I am not questioning the quality of these players, but the quantity. Even Victor Moses could be considered an attacking midfielder, so what was the club thinking? And whose decision was that? If it was Di Matteo, then he deserves the blame but if he didn’t pull the trigger, then the finger should be pointed elsewhere. While the club splashed the cash on attacking players, they forgot to sign a back-up striker. We all know Abramovich wanted Fernando Torres to play as much as possible after splashing out $80 million on him last year, but still there should have been a plan B. Especially if you consider Daniel Sturridge was apparently not an option for Di Matteo. Another big mistake made by Chelsea was not investing in a quality defensive midfielder. If they were going to line up with Mata, Hazard, Oscar and Torres, they needed to have at least one ball-winner in the centre of the park. Is Jon Obi Mikel that guy? No. Is Ramires that guy? No. In my view it was too easy to run past Chelsea’s midfield and that was a reason for their struggles. Last but not least injuries and suspensions played a part. Whether you like it or not, John Terry and Frank Lampard are still the heart and soul of Chelsea, and both of them have missed several games this season. There is one major error Di Matteo made and it sealed his fate. Against Juventus, he dropped Torres and played a 5-4-1 formation. I am sure if he had a chance to take that back, he would. Even if he wanted to play for a draw, he shouldn’t have changed his system in such a big game and dropped the only pure striker he had. That was a big no-no. So the Juventus game aside, how much is Di Matteo really to blame for Chelsea’s failings? It’s difficult to tell. He certainly couldn’t have helped the suspensions and injuries and he might not have been in charge of signings at the club. One thing is certain. Whoever replaces the Italian coach has a tough task ahead. Whatever he does and whatever he wins, his job will never ever be safe. Abramovich is wrong,i wonder who is gonna be the successor of Di Mateo? I really feel sorry for Di Matteo. He's a decent guy and a decent manager and its disgraceful that he has been treated so badly for winning the Champions League, which Abramovich was obsessed with winning and the FA cup last season. Yes Chelsea hit a rough patch during the season, but what manager in the history of football hasn't? A manager should always be given time to turn things around at the club. I don't blame Di Matteo for the signings, because I think Abramovich calls the shots on transfers and he signed players like Hazard and Oscar in my opinion to further entice Guardiola to the club. Di Matteo is a smart man and I think he needed another striker and another player to win the ball, but he wasn't allowed to. I agree that Chelsea got their tactics wrong last night. Although Torres is out of form, they needed someone, who could hold the ball up and match Chellini physically. I don't think Guardiola will ever go to Chelsea and this latest sacking at Chelsea has probably pushed him further away from Chelsea. I read somewhere that Guardiola will not be persuaded by money, but by the fact a club will give him time to build his own team and implement his philosophy at the club, which Chelsea can't offer him, but I do think Man City and AC Milan can offer him this. Good luck to Di Matteo, he can hold his head up high after this and will easily get another job somewhere else. Coach Roberto Mancini must be axed as well before next epl match. He is not a coach who can successfully defend the league title the team won last year.Coaching DOTAGE is catching up with him. That league was won on players individual brilliance. All i know is that chelsea are making a very big mistake by leaving drogba thou go another club insted of sign her 2years contract so since drogba go out in chelsea, chelsea just get down late all a blame not be for the coch but also player thanks. Roman's been on the vodka again. It was CRAZY to sack Di Matteo after such a short run of poor form by the team. Abramovic cannot have run his other businesses with such a lack of patience or he'd not have made a ruble. Stability and continuity is key in any operation so I'd say any blame lies at the feet of the owner not the manager. But I'm bound to say blame for what? Di Matteo guided Chelsea to the FA Cup, Champions League and to 3rd in the current BPL with more than half the season to go! I'd say club owners at every other Premier League team would consider that a success wouldn't you? Di Matteo made some mistakes, but so does every manager, even Sir Alex. 4 or 5 attacking midfield options is overkill but when Chelsea were flying at the start of the season their creative midfield was being praised left, right and center, so to criticize now is a double standard? Persisting with Mikel as the only holding midfielder was a mistake, especially when Romeu is more disciplined and reliable in that role, but perhaps Di Matteo's reluctance can be excused by the fact that Romeu is still only a youngster learning his trade. Fielding Torres was a HUGE mistake, but it was not Robbie's but Roman's since the owner seems intent on saving face at any cost to the team after laying out so much money on this embarrassing failure. Torres has lost it, plain and simple. He has had so many chances to redeem himself but he hasn't been able to take any of them. Don't let his position as the club's joint top-scorer for the season fool you, the stats lie! He is virtually NO threat to any defense. He's lost his pace, his touch, his creativity and his self-belief. His inclusion in the starting line-up has been a sick joke and his absence from the game with Juve had no adverse affect despite the result. He's now so ineffective he doesn't even merit the term "striker", "passenger" "waster" "pouter" or resident "comedian" would be more appropriate. His continued involvement is purely Abramovic's's fault, and if the owner has brought in Benitez to ensure his man gets a game then he's an even bigger fool than he already seems to be, not least of all because Benitez has a history of clashing with higher ups who interfere with the playing side. At Liverpool and Inter he took offense when his authority over team affairs was challenged, so unless his sabbatical has turned him into a yes man this new appointment can only end in tears. And what a shame that is for the fans as to my mind the team's brief loss of form is no more than a blip during a period of transition from the Drogba, Lampard, Terry era to a new era of potential success. Di Matteo may not have taken them to the heights again in a hurry but he had done little to suggest he wasn't at least the man to lay the foundations. Now, thanks to the impatience of Abramovic, the plan has been ripped up yet again and it's back to square one. Finally, what does this do to Abramovic's hopes of realizing his dream of hiring Pep Guardiola as Chelsea coach? I mean if you're Pep (who's rich and not money motivated anyway), would you be beating a path to the Bridge knowing that if your boys suffer a short loss of form your previous achievements and reputation will be rendered null and void. With respect Mr. Oligarch I'd suggest that's resounding a Nyet!...Nostrovia. Drogba was the man of the match. Great mistaked chelsea ever made by allowing drogba to leaved after giving her champion victory. Isn't chelsea regreting her caused? yes,chelsea. Sacking coach manager for another is just just solution. Retrospect chelse. They lost the key! "DROGBA"
When Essien too was made to go I saw that Di Matteo wanted out. Drogba will come back on loan to chelsea but a replacement for Torres is required. Chelsea change of her squad after the champion league was too drastic.. we now have strange bed fellows who are yet to play together as team. consider Man U change of squad that was done gradually yet keeping Giggs for important times. Torres should be sacked too. In fact he should've been sacked even before Di Matteo. Drogba was a better player but Chelsea choosed not to read the writing on the wall and preferred Torres just because he had an ostentatious price tag. In order to put the house in order at Chelsea i would start by rebuking Roman, telling him how his attitude is making it difficult for managers to work with a relaxed mind and heart. Would also tell him that Chelsea is not his club and will never be his club. Then would off-load two of the attacking midfielders for an allrounder midfielder and a quality central defender in the mould of Vidic. Then would lure Drogba back and hire Guss Hiddink as manager. Fire the engine and listen! 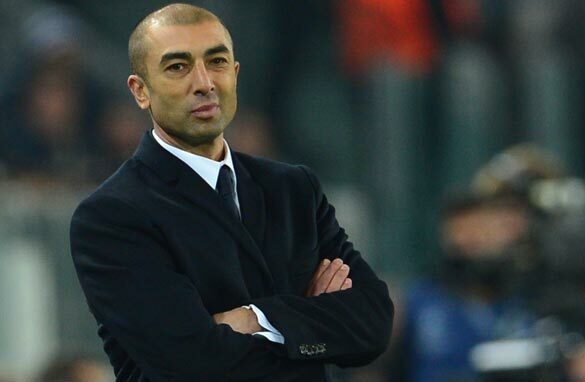 The sack was necessary as Di Matteo has reached his peak and does not seem to have futher drive for success. He was like a student that unexpectedly passed an exam that he never expects ( Champions Cup). To Di Matteo , there was nothing else. Futher , the signings was not completed as two or three players was needed at the back more than the front. There is nothing so fantastic about chealse back four. Its time new players be injected at the back. N02 , 3 and 4 urgently. This man is playing whit people who loves football, just because he have money. My advices to all football lovers is to boycott this clud like i do as long as he is the owna. Chelsea is in a transition period. Players need time to settle and deliver. In the last couple of seasons core members like Alex, Drogba, Anelka, Kalou, Essien, Ricardo, Malouda, Boswinga, Zhirkov, Deco, Ballack and Belletti have all gone and are plying their trade elsewhere. Many of those superstars were Jose Mourinho recruits and over a period of time they had delivered what was expected of them. Roberto di Matteo did his best and the squad did manage to climb the podium finally. All the best to Roberto in his career as manager. look Chelsea stumbled to the FA cup and champions cup wins. the owner saw that. he saw they were worse this year. De matteo had to go! the patience dog eats the fattest bone. so Mr Owner of Chelsea , be patience like a vulture waiting for a dying cow. I tank roberto for the good work at chelsea.the club should try and sign falcao and a better coach like pep so that the team will move ahead. As for me and many other Chelsea fans, Fernando Torres is hugely over rated, they said he was not playing well because Drogba is taking his playing roll. Now that the spanish press together with the english press has chased drogba away to china, what has Torres, a £50 million player does for chelsea since drogba left, NOTHING. Pay me £1,000 a month and i will do a better job tha Torres. Pls bring drogba before it is too late. It is just because the owner usurps the tasks of the Managers for example, who to play, who to buy that have caused problems in the team. And most of all the lack of patience, football is not always a win win win win win win win........... thingy, there must be challenges along the way. I sympathize the coaches at the club who are ever under such pressure. It was very unfair to axe some one who has done his best. Chelsea fc will always be my club no matter what may. I love the Club. Whoever comes let him be and who goes go. (soldier go, soldier come, barrack remain). The attitude of the owner of the highest shareholder in chealse is too bad. He always think forward no backwards and this time it will not favor him . Well,what u gonna say?It's d blues after all!What has turned out 2b d most unpredictable club in d last decade or so.Ur analysis is spot on...Buying innately gifted midfield players n forgetting d striking n defensive positions,d big boss always trying 2 force d hand of d incumbent coach by directly or indirectly imposing players on him,d coaches themselves not having that job security going by d d clubs coaching history.All these combined factors will only have 1 outcome – CHAOS! Am a blues fan,and am getting used 2d unpredictability of d club.4 me,it's part of being a true fan.Many say Roman really has d interest of d club @ heart,with him chasing Pep n d famous tiki-taka Barca style.Well,lets see if d end will justify d means...but until then,we'll all have 2 wait 4d big boss 2 make his next unknown chess move!